Nothing quite beats my moms homemade turtles! They are delicious, and very easy to make. 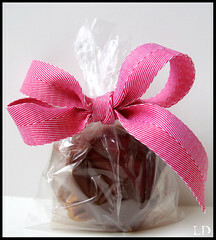 All packaged up with a simple bow they make the perfect gift. Since the holidays are right around the corner, I thought I would give away 3 packages of these delightful little treats to 3 random winners! All you need to do is leave a comment on this post and I will draw 3 names Monday morning and announce them here on my blog! In a heavy saucepan combine sugar, and corn syrup. Bring to a boil, stirring constantly. Once mixture starts to boil add the butter and condensed milk. Stirring constantly. Cook for approximately 15 minutes or until the temperature reaches 230 degrees on your candy thermometer. Take pan off heat. Make your caramel and set aside. Line 2 cookie sheets with parchment paper and lightly spray the paper with Pam. 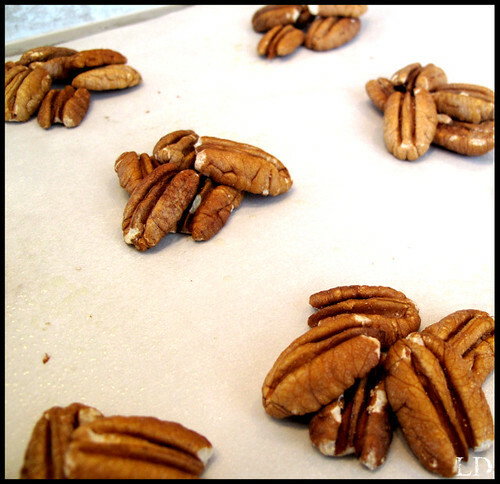 On your cookie sheets make small piles of pecan clusters in rows. With two spoons dollop a small amount of caramel onto each cluster. Immediately place your cookie sheets with your caramel nut clusters into your freezer. While your caramel is hardening in the freezer melt your chocolate. I melt my chocolate in a glass bowl in the microwave. Be careful you do not burn your chocolate, 1 min should be enough. Stir your chocolate until it is all melted. If you need to melt your chocolate more, only put it back into the microwave for 20 seconds at a time. Take your clusters out of the freezer and dunk the tops of the clusters with chocolate and set carefully back onto cookie sheets. You now have turtles! Let your chocolate set. Then package. We are invited to a "Get Acquainted" Christmas Open House on December 19; your Blackberry Brie will be the perfect appetizer to take. Warm and fruity Brie for a cold evening, everyone will love it I am sure! I love turtles! I will have to try your recipe, thanks for sharing! The turtles look great! Can't wait to try making them. Oh Laura- now I am really hungry! I went and read all your recipes- yummy! What a wonderful blog! YUM! I love turtles! My SIL makes these every year...my fave! I'm going to try them myself, this year. Thanks, Laura! These look heavenly! I can't wait to make them. Amazing. Just looking at them makes my mouth water! YUM! I am going to try these! thanks for the nudge!! These look so fantastic and seem so easy to make! I will absolutely use this recipe. Thanks a ton! Actually my first time to your site and am super happy it was for this post! Absolutely love Turtles. Grew up getting them every Christmas. OMGosh these are absolutely ADORABLE! I bet they taste waaaayyyyy better than the store bought ones. Thanks so much for another great recipe! YUM! Thanks for the sharing the recipe! Hopefully I will be lucky to receive some. YUMMY goodness! I had no idea you had a food blog now - thanks for pointing it out on facebook! Wow you are so talented paper crafting and cooking to boot! I am amazed! Am loving your blog. Planning to try the lasagna for the hubby soon! Pick me! Pick me! ;) I have experienced these DELICIOUS treats straight from Nana and would love to get my hands on some more. Mmmmm... I love stalking your blogs. Hope you're doing well! Later! Food blog, huh? I am SOOOO THERE!! lol. The turtles are one of my all time favorites! I even ask Dairy Queen to make my Blizzards in Turtle flavor even though it's no longer on their menu! 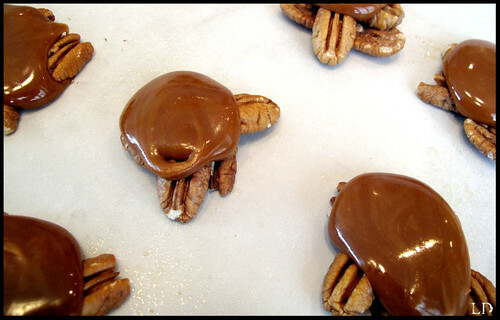 Those turtles are wicked...I never heard of the before but what a sweet and easy recipe and such a fun gift to make. Fabulous! These look great! I am also a baker and will make them this holiday season. God bless and Merry Christmas! Laura, I didn't realize you had a food blog besides your paper blogs! This is great, and the turtles look yummy! Yuumm they look amazing! Who needs a diet? not me! 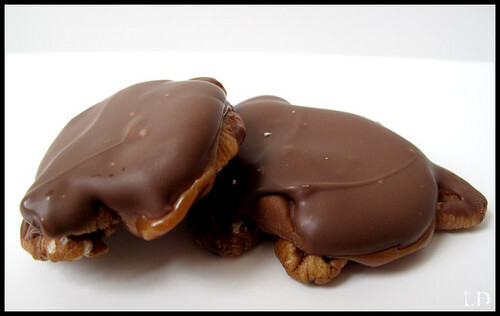 Oh, Turtles are one of my favorite candies! Thanks for the RAK! Becky G.
Oh they look delish!! I love turtles and the packaging is sooooo cute! These look wonderful! I love your blog, too. I can't wait to try some of your recipes. Have a happy day! I am just amazed by your site. It wonderful and you should be proud! Laura! I'm loving this blog - so inspirational since I'm so awful in the kitchen! Everything looks so beautiful! and Delicious! YUMMY Laura! Thanks for the recipe and the chance to win some of your little delights! Now I need to go buy a candy thermometer so I can make some! LOL! HUGS! these look so yummy! I love turtles! Those look amazing,thanks for sharing!! I am SO trying these, Laura! LOVE turtles! I LOVE turtles! Trade Joes use to sell them but now they have discountinued. Boooo. But now, today, Dec. 7, I feel like I have a reason to exist. Thank you. I tried to make these today and it was a nightmare! The caramel couldn't have more of a pain. Any suggestions? Or maybe I'll get lucky and win some so I can see what they are supposed to be like. can i ask how many this recipe yields?! These turned out great, Laura! I made them as stocking stuffers. Everyone loved them! It made a HUGE batch! Thanks! OMGosh Laura!! I love Turtles...can't wait to give this one a try!! Yummy!! it seems good. I've bookmarked it in my google book marks.